Statistics recently released by Met Éireann reveal the severity of December's conditions and the overall weather picture for 2015. Global temperatures are continuing to rise, with 2015 down as the hottest year since records began in 1880. Last year’s temperature rise shattered the record of the previous hottest year, 2014, by a near record increase of 0.13 degrees. Ireland escaped the heat because the North Atlantic experienced an unexplained cold snap. There has been a “persistent cool anomaly” in the area which helped to keep our mean temperatures at least half a degree below normal in 2015. The rise in temperatures everywhere else demonstrates the continued long-term warming trend according to the National Aeronautics and Space Administration (Nasa), and the National Oceanic and Atmospheric Administration (Noaa), the two US bodies that compiled the data. The Earth’s average surface temperature has now risen by about 1 degree since the late 19th century. This is half way to the 2 degree target accepted by the 190 countries who attended the COP21 climate change talks in Paris last month. The 2015 figures were expected to break records, Met Éireann’s head of forecasting Gerald Fleming said. The underlying rise due to human-induced climate change was exacerbated by the ongoing El Nino event in the Pacific Ocean, he said. “El Nino is a big factor. We know when there is an El Nino it raises global temperatures, but it is building on the underlying climate change,” he said. The North Atlantic cool anomaly started more than a year ago, but what is causing it is not known, Mr Fleming said. It ensured 2015 was not a record warm year for Ireland. The 2015 mean temperature at the Dublin Airport weather station was a full half degree below normal for the year, Met Éireann climatologist Aidan Murphy said. Although there has been a warming trend here since the 1990s, “we have a maritime climate” so that helped hold temperatures in check. Our warmest year on record at the Dublin station was 1989, followed in order by 1990, 1949 and 2006. The 1989 mean was 10.6 degrees, while the 2015 mean was 9.3 degrees. A very different picture emerges for global figures and the warmest years. 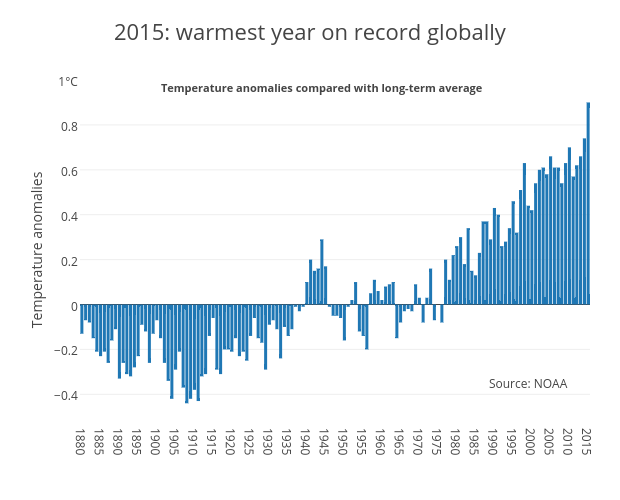 Ten of 2015’s 12 months set temperature records. Asia and South America experienced their warmest years on record, while Africa and Europe had their second warmest, North America its fifth warmest and Oceania its 6th warmest. This is based on data going back to 1910. Spain and Finland had their warmest years while Austria, France, Germany and the Netherlands all had years placed within their warmest five years on record. Although El Nino was expected to push up temperatures, the jump in 2015 was off the charts. Temperatures for 2015 were up by 0.13 degrees over 2014 while that record year was 0.04 degrees above the third warmest in 2010. Noaa now ranks its top 10 hottest years in order as: 2015, 2014, 2010, 2013, 2005, 2009, 1998, 2012, 2007 and 2006. This is based on the base period 1951-80. Unthinkable: Can a steak tax tackle climate change?